While this refers to Canada it is a must read for all, as it also includes France, Germany, Italy, Japan, Russia, the UK and the US. In fact the sphere of influence extends to nearly all the world. Those countries, such as the ones on the gold standard and others that are not under the current world bank scam regimen are in great danger of having their monetary methods usurped. This through the typical installation of puppet governments that will conform to such control tactics. All in the name of democracy of course! This is the primary reason why we have taxes.... to be further crystallized in an another post on the US Federal Reserve system coming soon. Welcome to CAP'S Bank of Canada Tutorial. One of the major problems facing Canadian policy makers and activists today is a misunderstanding of or refusal to consider the uses of The Bank of Canada (BoC). This problem is exacerbated by a media blackout on information about the Bank's uses- which will be discussed in the tutorial. This problem exists in all G-8 countries! The tutorial details the nature of the problem in Canada, and how it may be resolved. Until the BoC opened in 1935, The Treasury Board, which administered the Finance Act of 1923, had no responsibility to see that advances made to the banks answered the needs of the economy. The unsatisfactory nature of that arrangement was revealed during the Great Depression. In 1934 Parliament passed the Bank of Canada Act, and the bank itself was founded a year later. Since 1938 the bank has been owned entirely by a single shareholder- the federal government (i.e., Canadian taxpayers). The 'nationalization' of 1938 perfected the mechanism that allows the central bank to create money to finance federal projects on a near interest-free basis. It may make loans to the Govt. of Canada or any province (BoC Act Article 18 (c), (i) (j) or guaranteed by Canada or any province (c). This is explained fully in our "Article 18" link here. Initially, the bank fullfilled its mandate. It was of great assistance in getting Canada out of the Great Depression, financing the war, and building infrastructure and social systems in Canada into the 1970s. But then things began to change. In mid-1991 a bill was slipped through parliament without debate or press release phasing out the statutory reserves over a two-year period (subsection 457 of Chapter 46 of the Statutes of Canada.) That left higher interest rates the only means of "fighting inflation." (2) "zero inflation": a perfectly flat price level was proclaimed essential. Most of Canada's federal debt was run up in the attempt to enforce these provisions, which contradicted the BoC's charter. Such contradictions, however, did not deter Mr. Crow, and subsequent BoC Governors, from pursuing like policies to this day! We now consider two unbelievable facts- so astonishing that most people simply won't believe them!! Indeed, they do defy the imagination! Unbelievable Fact # 1: How Money is Created. Money is created out of nothing. Myth: it's based on Gold: Not so! The Gold Standard was abandoned years ago. -Well....it's not quite created 'out of nothing': it's created out of a faith based on the credit of a nation: otherwise, it would be worthless. If I give you a $20 bill, you believe (have faith) that you can use it as a medium of exchange to buy other goods or services. Moreover, there are two ways to create money (out of essentially nothing). GCM (Government Created Money), created by the federal government. People understand this method. Most people when asked would say, "well, the government creates money." That's true. But how MUCH of the money supply each year does the government create? About 5%. That's all. So who creates the rest? BCM (Bank Created Money): the private banking system. How does the private banking system "create" money? Simple! But unbelievable! Bear in mind that MONEY IS CREATED OUT OF NOTHING. So, when you make that $30,000 loan at your bank for a new truck, that amount is typed into you bankbook. Seconds earlier it didn't exist! Now YOU owe that money TO the bank, + interest! Myth: the money for your loan is somehow "backed" by deposits on-hand in the bank where the loan is made... Not so! You, as a citizen or a business, don't have a choice. Much though you might like to, you can't create money. You have to borrow your money from private banks or other lending institutions. But governments have a choice! The federal government can EITHER create its own debt-free and interest-free money (GCM) OR borrow it AS debt, and AT interest from the private banks (BCM). The provincial and municipal governments can choose to borrow, at low interest rates, from EITHER the Bank of Canada OR borrow from the private banking system at substantial interest rates. GUESS WHICH CHOICE OUR GOVERNMENTS MAKE?? You may say, "-So what? Some abstract argument about 'how money is created' doesn't effect me, anyway..."
-Oh yes it does! You'd better... believe it! l It is important to realize that this is not some abstract, intellectual exercise. It's YOUR money! 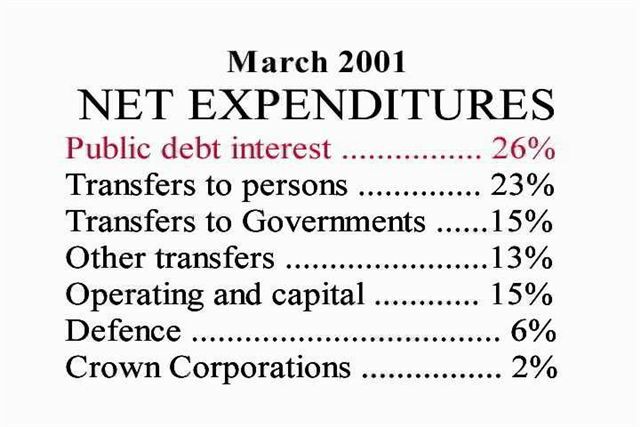 l Your LARGEST expenditure- (The so-called 'public debt interest', i.e., "paying down the debt") is to the private banking system!! The Law is the Law! In this section, we refer to Article 18 of The BoC Act, listed under BUSINESS AND POWERS OF THE BANK. Our commentary is added in red; emphasis by underline. We mentioned earlier that since 1938 the BoC has been owned entirely by the federal government. It is essential to understand what this means, in order to understand the full significance of the powers of the BoC. In a word, the BoC may create the money to finance federal projects on a near interest-free basis. It may, if it wishes, lend money to the provinces and municipalities as well. It works this way: the coupons paid on government debt held by the Bank of Canada find their way back to the federal treasury with the rest of the bank's earnings. In recent years this important function of the bank has been left, in large part, to rust. Article 18 sets out the Bank's powers of lending to our governments. Article 18 (c), dealing with funded debt- bonds or treasury bills- authorizes the Bank to "buy and sell securities issued or guaranteed by Canada or any province." No restriction is set on such holdings; limits on these powers must then be sought in the real economy- whether or not further money supply created by such loans would add to the demand in an economy already employing all available resources. Were the Bank to go on increasing its lending to governments under such circumstances, it would indeed be inflationary. But such a state of affairs has not existed for decades. Article 18 (j) deals with unfunded loans to governments- ie, advances against their income not formalized in security issues. The passage "but such loans outstanding at any one time shall not..." clearly implies that such unfunded debt may be rolled over when due. Let us stretch our horizons a bit before concluding. Just suppose the money-creation function were split equally between the government of Canada (GCM), on behalf of the citizens of Canada; and the private banking system (BCM). This would release $15 billion/year (approx.) to be used for the needs of Canadians. l Increase tax revenues for all governments, so making funds available for other projects. It would create a win-win situation! The people of Canada would benefit immensely, and on an ongoing basis; and the private banking system would still be making considerable profits. Would it 'cause inflation'? Absolutely not! It is the total amount of money which determines prices, not who creates it. None of what we have been saying is all that hard to understand; nor is our 'Vision' impossible, untenable, or out of reach. But ideological persuasion is strong, especially when supported with the full force of media. Even many activists and investigative journalists appear to be unaware of the importance of uses of national Central Banks. On the basis of the information given in this tutorial, you can see that what is desperately needed in Canada (and in all G-8 countries!) is for the federal Finance Minister to direct the Governor of the central bank (in Canada's case: The BoC) to create a larger percentage of what constitutes the money supply each year. If this were done, we would have a national (and global) social structure quite different from the one we have today! The tragedy is that this could be done- today- given the political will to do so. The hope is that, someday, it will be done. We hope that YOU will do what you can to make it come to be, through educating others about the powers and capacities of national central banks. If you have any questions or comments about our tutorial, please contact us. I am sure that you have seen America: Freedom to Fascism, if not it is on my site above. I have a question, is there a law in Canada that requires us to pay taxes? "By April 19, 1933, Canada was bankrupt" I am looking for the documation to back this up. Is it on this website somewhere? Article 17 of the act says the BOC is owned by the Queen! Please explain.